"Enchanting Tree of Life" This is another image from my shoot that almost didn't happen! Pouring rain for hours before, it stopped raining just as I arrived. This Japanese Maple tree had such luscious leaves with orange, yellow and red highlights. The green bushes and leaves around complementing the primary colors. Such an amazing setting. My favorite parts are the twisty and knarly branches that rise to the sky. The other hidden details I love are the red pine needles all around and the moss on the tree trunk and branches. 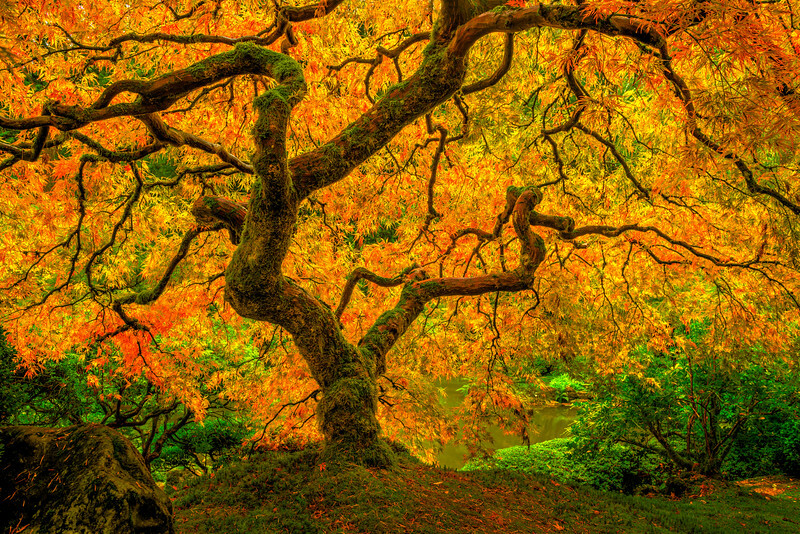 Japanese Maple trees are some majestic and powerful. I wish I had one like this in our garden!! Captured with the Nikon D800 at 24mm, the details on the tree are amazing to see up close!